This beutiful vintage-style sleeveless dress is crafted from a delicate net fabric with lovely beade..
Machine Washable Vertical Seams Concealed Zip 3/4 Length Sleeves Simplicit..
Hand Finished Batik Print Button Up Front Matching Belt Full Skirt 100% Visco..
Bestselling Shape Vintage Inspired Print Sheer Sleeves Tie Neck Detail Midi L.. Structured square-neck dress with V-shaped back and an abstract blue floral print. Dress length (..
Wildflowers and butterflies-print tunic dress exclusively designed by Sugarhill. Length: Fr..
Update your little black dress with our rose emblazoned Geisha Dress. With a bold rose embroidery ar..
Time to get your shimmy on with the Maisie Tassel Shift Dress. This is a simple shift dress shape wi..
Let your femininity shine through in the Margaux Dress. 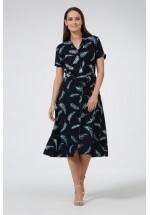 This versatile dress featured soft layer..
Vintage feminine with a hint of flamboyance, the This Old Thing Smock Dress stands out thanks to a h.. The perfect day to evening dress to take you through party season. This delightful velvet shift dres..
Uttam Boutique wrap dress in navy featuring a geometric grid print, 3/4 length sleeves and a delicat.. Sitting just above the knee this print draped dress inspired by the work of American artist Jeff Koo.. This eyelash lace cream and black party dress falls above the knee and features a round neck, two-to..